Marisa Lynch of New Dress a Day can make even the most hideous of thrifted dresses look gorgeous. 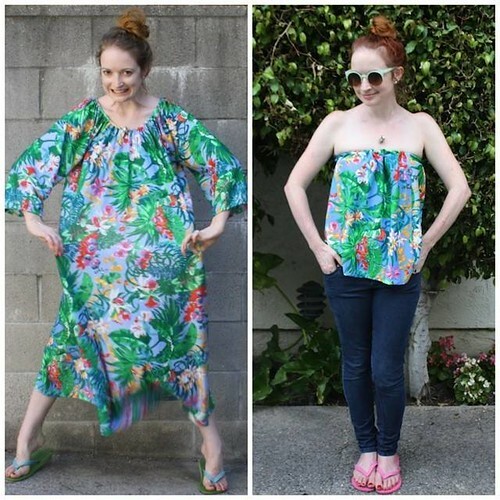 Sure it helps that she is a cute as a button, bubbly, redhead that models all the clothing - but for serious she works some muumuu magic. I have never seen frumpy go fabulous quite the way Marisa does it. 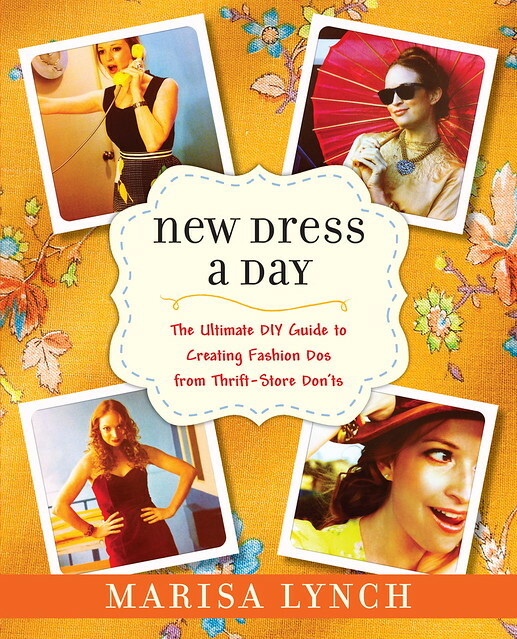 If you have not already become a devotee to her blog or picked up her new book New Dress A Day: The Ultimate DIY Guide to Creating Fashion Dos from Thrift-Store Don’ts I highly suggest you get on that, you will never vintage shop the same way again. 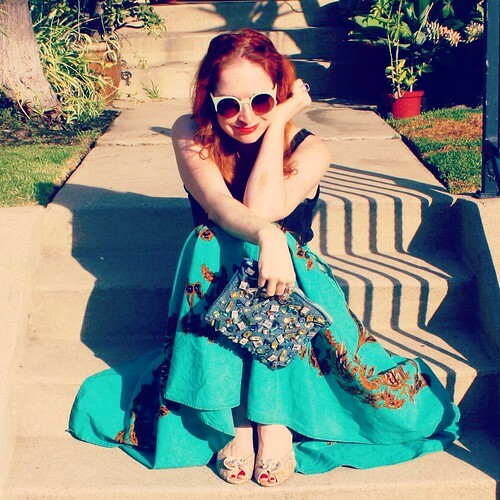 I saw on your blog the inspiration behind your endeavor into making a new dress a day. What was the first piece of clothing you ever made over? Have you ever made a new dress that was better before you got started? Do you always just make dresses? Oh there are definitely times where I don’t love the outcome of a project. I won’t lie… I’ve remade pretty much everything - dresses are my fave just because I’d wear them everyday, but I love redoing tops, skirts, shoes, accessories. Your book was actually inspiration for me when it first came out. I was always so taken by your projects! Every once in a while I’ll take on jewelry! I come from a long line of women who can sew. Those women sewed for me. I however have sadly stopped that tradition and don’t remember how to thread my bobbin. Do you come from a long line of seamstresses? How long have you been sewing? Where did you learn? What is your favorite era of clothing to thrift and make over? Why? 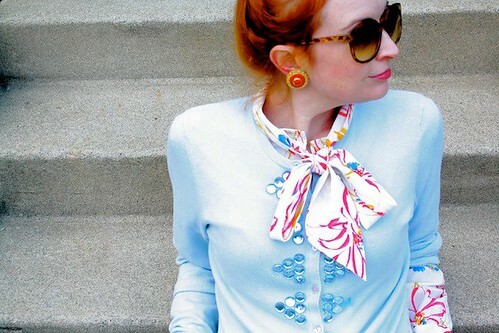 Do you love the fabric styles, textures, vintage buttons? 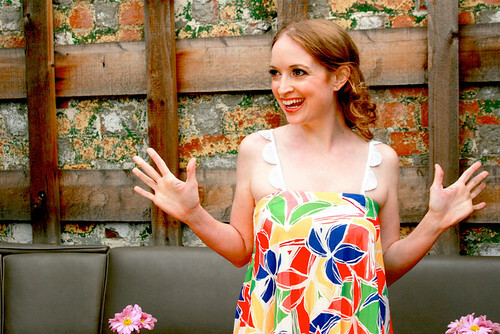 You have a book out: New Dress A Day. How was the experience of writing a book? What is your favorite project from the book? In a nutshell, writing the book was the hardest thing I’ve ever done, yet so insanely fulfilling when I actually saw it on the shelves of bookstores. I had about 6 months to source garments, shoot before looks, actually remake the pieces, shoot the after looks, and then write it all, so there would be days where I’d be in the same outfit which is completely ironic. I LOVED the costume chapter the most - we shot at the ultra kitschy Farmer’s Daughter Hotel, so dressing like Alice in Wonderland, holding pewter bunnies in the lobby while people were checking in was one of the best moments. People are invited to share their own makeovers on your website. What has been your favorite? People are also invited to send you things to makeover. Have you ever received a dress that you could not bring yourself to put scissors to? Honestly, the pieces that people send in to me to redo are always so amazing!! Whether it’s something they wore to a wedding in the 90s or just a horrifying frock found at a garage sale, I love to see what’s inside the packages. I find myself saying, “I just want to make my life about thrifting all over the country” when I open packages coming from Ohio or all the way from Japan. And the makeovers that readers send in...I’m just so happy seeing people get so crafty and creative - I’m always blown away by the outcomes. 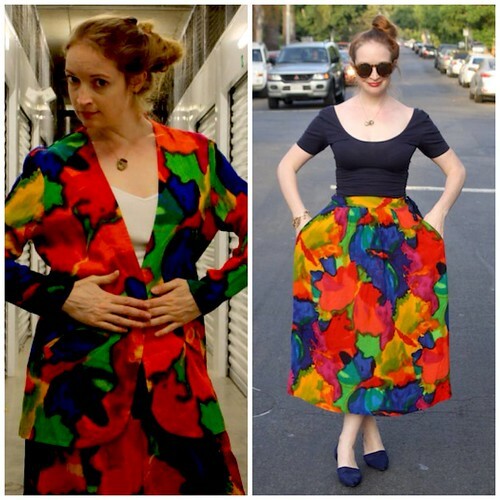 Have you ever had vintage clothing purists get upset about your remaking clothing? I know when I ran Naughty Secretary Club and remade vintage costume jewelry occasionally someone would act like I had committed a sacrilege by restringing a few beads. Don’t even get me started on the reactions over any kind of up-cycled book project. Haha, there’s always a handful of “why did you remove those sleeves?!?!? !” comments that come in every once in a while. But it’s like anything, you take it with a grain of salt because there are just as many people who love the fact that those sleeves are getting removed! Is running New Dress A Day your only job? Do you write or create for any other blogs? Any product lines in the works? TV shows in the future? Lines for Target? Give us the scoop. Besides sewing what are some other methods you use to remake clothing? Do you ever dye, embroider, embellish? I’m OBSESSED with dyeing. I always tell readers and friends that using fabric dye is the easiest way to really make a 180 difference in any piece of clothing. Take something stained from the donate pile and give it a brand new look with a new shade of color. And...it’s not as scary to use as some people think! Where do you see New Dress A Day heading? Do you still feel inspired to remake clothing? I am still inspired to remake clothing but I think after doing something for close to six years, there’s definitely room for growth and change. I feel like I’m always rethinking what I want (ugh, the up and down struggle…) and what readers want to see. I am looking forward to some fun changes coming down the pipeline though. Thanks Marisa! I suddenly feel inspired to go thrifting.